The AFC Championship game on January 12, 1992 featured the defending conference champions, the Buffalo Bills, hosting the Denver Broncos, a team that had reached the Super Bowl three times in the preceding five seasons. Buffalo, coached by Marv Levy, had narrowly lost the previous year’s Super Bowl to the Giants and again topped the AFC East with a 13-3 record in ’91. The high-powered offense that led the league in total yards featured QB Jim Kelly, RB Thurman Thomas, and WR Andre Reed. The defense was strongest at linebacker, a group that included Pro Bowlers Cornelius Bennett and Darryl Talley, and had plenty of speed, but star DE Bruce Smith missed all but five games due to a knee injury and the unit as a whole was showing signs of wear. Still, the Bills easily dispatched the Chiefs in the Divisional playoff round and were 11.5-point favorites as they sought to win the conference title for a second year. The Broncos, under the direction of Head Coach Dan Reeves for the eleventh season, bounced back from an off-year in 1990 to win the AFC West with a 12-4 tally. Denver had the AFC’s top-ranked defense, also boasting an excellent group of linebackers plus the fine safety tandem of Steve Atwater and Dennis Smith. As had been the case for the last decade, the key to the offense was QB John Elway. RB Gaston Green came from the Rams and had a career year with 1037 rushing yards. Denver narrowly defeated the Houston Oilers in its Divisional game to advance to the AFC title contest. It was sunny and temperatures mild, although windy, at Rich Stadium with 80,272 fans in attendance. The Bills had the first possession and punted. The Broncos, starting from their 45, advanced to the Buffalo 39 before having to punt, but again had good starting field position at their 49 after the home team again had to kick from deep in its own territory. This time Denver reached the 34 before Gaston Green was stopped for losses on successive plays. Facing third-and-15, John Elway was sacked for another 12 yards by NT Jeff Wright, once again forcing a punt. The Broncos got the ball back in short order when a pass by Jim Kelly that was tipped at the line was intercepted by NT Greg Kragen. Taking possession at the Buffalo 29, the visitors were still unable to gain ground and came up empty when David Treadwell’s 47-yard field goal attempt sailed wide to the left. The Bills reached Denver territory for the first time on the ensuing series, but had to punt from the 44. Green ran for 18 yards and Elway passed to WR Vance Johnson for a gain of 10 more as the opening period came to a close. With the ball once more in Buffalo territory, an apparent interception by CB Kirby Jackson at the two was overruled by replay review. This time the visitors got to the 11 thanks to short completions by Elway, but Denver was moved back from there on a fumbled snap and sack. The game remained scoreless as Treadwell’s 42-yard try for a field goal hit the right upright. The Broncos continued to win the battle for field position, but also continued to come up empty as Treadwell missed a third field goal attempt, this time from 37 yards, that again struck the right upright. Neither team threatened to score for the remainder of the first half. Thus far, Denver was doing a superb job defensively of pressuring Kelly and shutting down the Buffalo offense. But while the Broncos were winning the statistical battle, having outgained the Bills (123 to 58) and accumulated nine first downs to Buffalo’s three, they had nothing to show for it on the scoreboard. The situation remained much the same as the third quarter commenced and the teams exchanged punts. Finally, the Bills put together a promising drive. Thurman Thomas ran effectively, Kelly completed two passes, and Andre Reed gained 16 yards on a reverse. However, after getting to the Denver 26, Kelly’s next throw was picked off by CB Tyrone Braxton. The reprieve proved to be short-lived for the Broncos. Two plays later, an Elway pass that was tipped by Wright was intercepted by LB Carlton Bailey, who returned it 11 yards for a touchdown (pictured at top, Wright #91, Bailey #54). Scott Norwood added the extra point and Buffalo was ahead by 7-0 with 5:28 left in the period. The teams traded punts as the game headed into the fourth quarter, and now backup QB Gary Kubiak was in for Elway, who suffered a thigh injury early in the second half and finally had to leave the contest. Kubiak completed two passes and Green had gains of ten and seven yards as the Broncos advanced to the Buffalo 31. LB Darryl Talley sacked Kubiak for a 10-yard loss on a second-and-nine play, and while the quarterback was able to regain eight yards of that on a scramble, a fourth-and-11 pass to WR Michael Young came up a yard short. The Bills responded with a 50-yard drive in nine plays. Kelly completed consecutive throws to TE Keith McKeller, the second for 25 yards in a third-and-five situation. Runs by Thomas and a throw to Reed for 10 yards got the ball to the Denver 26 and Norwood booted a 44-yard field goal to put Buffalo ahead by ten points with 4:18 remaining in regulation. The Broncos came back with an 85-yard series that took eight plays. Kubiak ran for 11 yards on first down and then completed three straight passes to Vance Johnson, the longest for 24 yards. Kubiak hit on two more throws to Johnson, for 23 and eight yards, and the quarterback finished the possession off with a three-yard carry for a TD. Treadwell’s conversion made it a three-point contest with the clock down to 1:43. 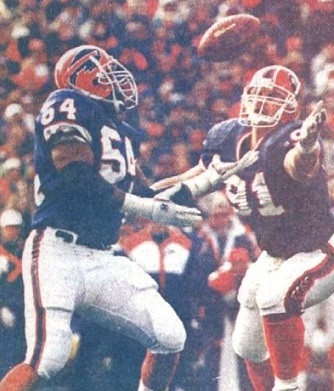 Denver succeeded on an onside kick that was recovered by Steve Atwater, but on the next play RB Steve Sewell fumbled after catching a pass and Kirby Jackson (pictured at right), who forced the fumble, recovered for the Bills. Buffalo was able to run the clock down to 17 seconds before punting, and while Kubiak completed two passes, time ran out on the Broncos at their 48 yard line. The Bills won by a final score of 10-7. Buffalo’s offensive output was far below its regular season average as Denver led in total yards (304 to 213) and first downs (20 to 12). The Bills recorded four sacks to one by the Broncos. Each club turned the ball over two times. However, Denver’s David Treadwell missed all three of his field goal attempts while Scott Norwood of the Bills was successful on his one try. Jim Kelly, who was harassed by Denver’s blitzing, completed 13 of 25 passes for 117 yards with no touchdowns while giving up two interceptions. Thurman Thomas rushed for 72 yards on 26 carries and had three catches for 15 yards. 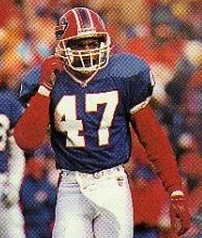 Keith McKeller led the Bills with 39 yards on his three pass receptions. 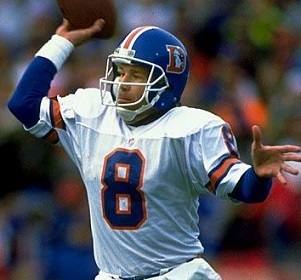 For the Broncos, John Elway was successful on 11 of 21 throws for 121 yards and was picked off once while Gary Kubiak (pictured below), the long-time backup who had already announced his retirement and was appearing in his last game, went 11-of-12 in relief, for 135 yards, and ran three times for 22 yards and a TD. Vance Johnson caught 7 passes for 100 yards and Steve Sewell gained 78 yards on his 7 receptions, although he also gave up the critical late-game fumble. Gaston Green compiled 53 yards on 19 rushing attempts. The return to the Super Bowl did not bring Buffalo better fortune. The Bills lost to Washington in the second of what would turn out to be four consecutive Super Bowl defeats. Denver dropped to 8-8 in 1992 and next returned to the playoffs as a Wild Card entry in ’93. The Broncos did not advance as far as the AFC Championship game again until 1997, when they won their first NFL title.